Now we introduce an important type of object called a generator, which allows us to generate arbitrarily-many items in a series, without having to store them all in memory at once. A generator is a special kind of iterator, which stores the instructions for how to generate each of its members, in order, along with its current state of iterations. It generates each member, one at a time, only as it is requested via iteration. Recall that that a list readily stores all of its members; you can access any of its contents via indexing. A generator, on the other hand, does not store any items. Instead, it stores the instructions for generating each of its members, and stores its iteration state; this means that the generator will know if it has generated its second member, and will thus generate its third member the next time it is iterated on. The whole point of this is that you can use a generator to produce a long sequence of items, without having to store them all in memory. # A very common use case! 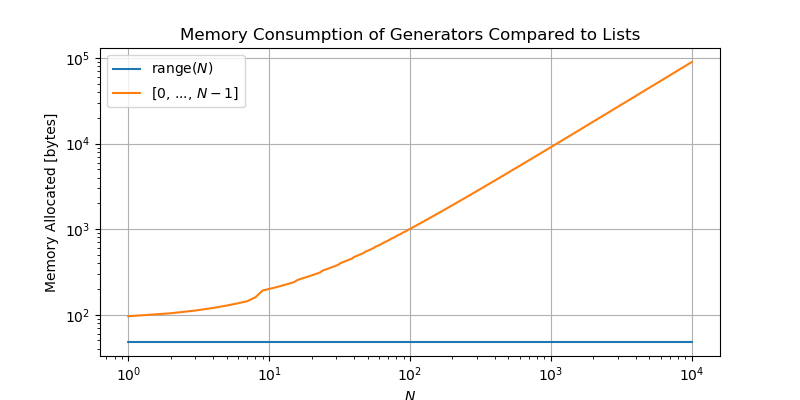 Given our discussion of generators, it should make sense that the memory consumed simply by defining range(N) is independent of \(N\), whereas the memory consumed by the list grows linearly with \(N\) (for large \(N\)). range is a built-in generator, which generates sequences of integers. Using range in a for-loop, print the numbers 10-1, in sequence. The syntax (<expression> for <var> in <iterable> [if <condition>]) specifies the general form for a generator comprehension. This produces a generator, whose instructions for generating its members are provided within the parenthetical statement. This means that <expression> can even involve inline if-else statements! A generator comprehension is a single-line specification for defining a generator in Python. It is absolutely essential to learn this syntax in order to write simple and readable code. Generator comprehensions are not the only method for defining generators in Python. One can define a generator similar to the way one can define a function (which we will encounter soon). See this section of the official Python tutorial if you are interested in diving deeper into generators. Note that (3, 5) is not in the series. Iterate over the generator and print its contents to verify your solution. The sole exception to this is the range generator, for which all of these inspections are valid. This computes the sum of the sequence of numbers without ever storing the full sequence of numbers in memory. In fact, only two numbers need be stored during any given iteration of the sum: the current value of the sum, and the number being added to it. # computes the sum of ... nothing! # `gen` has already been consumed! It may be surprising to see that the sum now returns 0. This is because a generator is exhausted after it is iterated over in full. You must redefine the generator if you want to iterate over it again; fortunately, defining a generator requires very few resources, so this is not a point of concern. # this check consumes the entire generator! A generator can only be iterated over once, after which it is exhausted and must be re-defined in order to be iterated over again. Because generators are iterables, they can be fed into subsequent generator comprehensions. That is, they can be “chained” together. A generator comprehension can be specified directly as an argument to a function, wherever a single iterable is expected as an input to that function. In a single line, compute the sum of all of the odd-numbers in 0-100. The built-in function next allows you manually “request” the next member of a generator, or more generally, any kind of iterator. Calling next on an exhausted iterator will raise a StopIteration signal. This is a great tool for retrieving content from a generator, or any iterator, without having to perform a for-loop over it. There is a bit of confusing terminology to be cleared up: an iterable is not the same thing as an iterator. An iterator object stores its current state of iteration and “yields” each of its members in order, on demand via next, until it is exhausted. As we’ve seen, a generator is an example of an iterator. We now must understand that every iterator is an iterable, but not every iterable is an iterator. # an iterator - you cannot call `next` on it. In this way, a list is an iterable but not an iterator, which is also the case for tuples, strings, sets, and dictionaries. Python actually creates an iterator “behind the scenes”, whenever you perform a for-loop over an iterable like a list. It feeds that iterable to iter, and then proceeds to call next on the resulting iterator for each of the for-loop’s iterations. This produces the exact same result as feeding the list function a generator comprehension. However, using a list comprehension is slightly more efficient than is feeding the list function a generator comprehension. Tuples can be created using comprehension expressions too, but we must explicitly invoke the tuple constructor since parentheses are already reserved for defining a generator-comprehension. The comprehensions-statement is an extremely useful syntax for creating simple and complicated lists and tuples alike. It can be useful to nest comprehension expressions within one another, although this should be used sparingly. # This creates a 3x4 "matrix" (list of lists) of zeros. Use a list comprehension to create a list that contains the string “hello” 100 times. Use a tuple-comprehension to extract comma-separated numbers from a string, converting them into a tuple of floats. I.e. "3.2,2.4,99.8" should become (3.2, 2.4, 99.8). You will want to use the built-in string function str.split. Replicate the functionality of the the following code by writing a list comprehension. # append 1 if lowercase letter is "o"
# append 0 if lowercase letter is not "o"
Is there any difference in performance between the following expressions? Is one expression preferable over the other? Why? >>> string_of_nums = "3.2, 2.4, 99.8"
It is preferable to use the generator expression sum(1/n for n in range(1, 101)), rather than the list comprehension sum([1/n for n in range(1, 101)]). Using a list comprehension unnecessarily creates a list of the one hundred numbers, in memory, before feeding the list to sum. The generator expression need only produce a single value at a time, as sum iterates over it.